Accompanying the governor’s post are super creepy photos of young children. A little girl makes a thumbs-up gesture next to a raccoon that appears to be dead. Another child smiles next to a raccoon that’s visibly terrified inside a cage. Please go back inside to your Xboxes, kids—to where at least whatever you kill isn’t real. Noem’s post is in regard to South Dakota’s disturbing new first-of-its-kind Nest Predator Bounty Program, which the state launched on April Fool’s Day but is sadly not a joke. From April 1 to Aug. 31, 2019, or until a $500,000 cap is reached, the South Dakota Dept. of Game, Fish and Parks (GFP) is offering residents young and old $10 for each tail of a raccoon, striped skunk, opossum, badger or red fox they turn in. 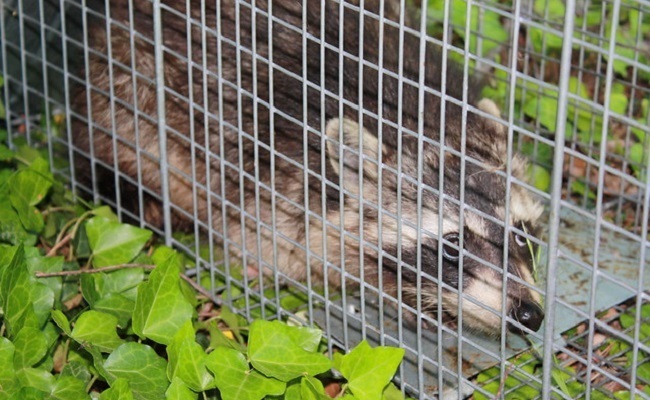 Last month, the state gave away about 16,500 live traps to residents. During just the first few days of the bounty program, residents turned in 300 tails to GFP offices around the state. South Dakota launched The Nest Predator Bounty Program without a public hearing. About a dozen people submitted comments to the GFP supporting the program, while about 100 opposed it, according to the Sioux Falls Argus Leader. A letter to the GFP from eight state wildlife and sportsmen’s groups asked that the program be delayed until it had been vetted. The purpose of the program is to protect the nests of pheasants and ducks (and undoubtedly to keep those hunting profits pouring into the economy). But during a public forum on April 4, the Rapid City Journal reports that some people said they were opposed to killing indigenous wildlife to protect pheasants, which aren’t native to South Dakota. One resident, Jamie Al-Haj, pointed out that rather than predators, it’s human activity, like using chemical fertilizers and draining wetlands, that’s a bigger danger to the state’s pheasant and duck populations. Supporters of the Nest Predator Bounty Program say it will bring back South Dakota’s trapping tradition by getting more young people involved. “It’ll make them better hunters and sportsmen,” Mark DeVries of the South Dakota Stockgrowers Association said at the forum. The Argus Leader reports that GFP Secretary Kelly Hepler told the department the program’s success won’t be determined by the potential 50,000 dead animal tails but by the “heartwarming stories” of families getting together outdoors to trap. I’m with Julie Marie, who wrote in a comment with over 1,400 likes on Noem’s Facebook post that she took her children outside—to pick up trash on the 10-acre property they share with animals. “They didn’t think about Fortnite for an entire day, and didn’t have to kill any animals to do it,” she wrote. It’s the 21st century, after all, and humane and effective alternatives to trapping are widely available. There is no reason to revive this cruel “sport”, and it’s deeply disturbing to encourage children to terrorize animals. There are better ways to deal with nest predators than by encouraging people to kill them for fun and profit. Please sign and share this petition telling South Dakota to end its Nest Predator Bounty Program. As there are so many comments in just 6 days, I did read most of these comments. And what did I found?? That a certain number of people just became a member of this site to defend the ideas of the South Dakotan Governor. My God!! I would recommend and BEG those people to just LOG OUT, right now. Thanks for being so helpful with your ideas. I did not know that I was a retard because I could not agree to hunting. At least, that's what you write. Well, there is nothing in this article about hunting. What is the use of being a member of Care2?? When you defend the trapping and killing of innocent wildlife animals you are not on the right website. This website is to defend the voiceless animals who are tortured, abused and/or killed for various reasons., except to obtain food. I DO understand that in very remote areas people have to hunt animals like deer to have some proteins on their platter. That's also why they go fishing. And when killing animals is just done for keeping your family safe and sound, then go ahead. Humans cannot live on some leaves and berries. And they have not other protein-rich food at their disposal to live a healthy life. Our ancestors (a very very long time ago) also went hunting and fishing. Many people in Alaska and Canada live in very remote, very small communities of maybe 30 or 40 people, and they hunt and fish just enough to survive. Tyler: Sorry wrong number. It takes two to discuss nonsense! I really hope this woman has NO CHILDREN. What a catastrophe would that be??? A very big ONE!! Russ Pietz : Good comment man, so happy to see you shoot them, and shoot them quickly to avoid unnecessary suffering... And all the hours this animal is trapped??? You can not avoid their fear, anxiety and stress. And what about other animals that are trapped instead of the "bad" ones you want to kill. Shooting is the best, you Americans can!! Children of 5, 6 years have special small guns to learn shooting. It's really impossible to survive in this society when you have no gun or you don't know how to shoot. Then explain me why in many W. European countries (a.o. Belgium where I live) possession of a gun is BANNED for all civilians except for some who have a job and are regularly endangered such as pharmacists (junks robbing them to get drugs) of jewelry shop owners, doctors visiting patients people at home during nighttime, etc. Each owner and gun is registered and each year, a local policeman is coming along to verify the papers, the gun, the registration number, quantity of bullets, etc... I must admit I feel safe in the streets, even at night. Maybe Americans should try this as well. Paul Cole, I am not a sociopath just because I eat 2 or 3 eggs a week and a small piece of meat of about 100 grams. It all depends where you get your meat and eggs. Just one more "detail". Can this Governor be brought before Court because she incites people and children to trap and kill animals? I could not understand that what she is doing is perfectly legal. Moreover, as Governor, you have the responsibility to take care of the people who voted for you and the others. Telling them to have a good, heartwarming afternoon in trapping and killing animals is not educative and socially totally unacceptable!! I really hope something can be done against this "wonderful heartwarming" woman. She is a public DANGER and most certainly she must be dismissed and never be in politics again for the rest of her life. People of South Dakota, I BEG YOU : TAKE STEPS AGAINST THIS MONSTER!! "Heartwarming stories of families going outside to trap". This is a quote of the article. Well, now I have to puke. SORRY!! W.t.f. is going wrong with humans?? We have 3 children and have REAL heartwarming stories going outside for picking berries, to watch the formation of a whole column of ants when you put some breadcrumbs or very small pieces of ham on the ground or watching the little frogs splashing in a small pool of water, and so much more!!. My children all are over 40 years old now, and when I look at the photographs we took then, warmth fills my heart. Why should trapping be revived? Tradition? So many animals are killed because of alleged traditions. We live in 2019... no longer the medieval times. Trapping is the most disgusting way to catch animals. They can not make the difference between a trap for them, or for other animals. They are trapped, eventually injured and stay there fighting for their life for X days, and when traps are not checked timely, starving from lack of water, food, or due to excessive stress or just killed by other predators. HOW FUNNY THAT IS... REALLY?? HEARTWARMING?? I wonder what this girl will think when in 6 or 7 years she will see the photo with "thumb up" with a dead raccoon. How will her friends in school react? Certainly, a lot will call her "murderer". Call the psychiatrist now, please!! Hurry ! !